Pierluigi Balducci was born in Turin on 13 October 1960, while Bix The Rabbit was born 40 years later by his fantasy and his hand. Pierluigi’s mantra is “We cannot extend our lives, but we have to do everything to expand it” – Accordingly, Bix The Rabbit has become his alter ego. This funny character is an excuse to share deep things with the necessary synthesis. Only a multiform creature as Bix could get this result. Pierluigi is a graphic designer, an illustrator, an art director and a multi-faceted artist who has worked in the top level advertising sector. Always sensitive to the language of images and intuitions that almost unconsciously emerge in the act of marking a sign on a sheet, Pierluigi has refined his sensibility and passion for visual synthesis at the school of the great master Armando Testa, founder of the Italian style of Advertising. As an illustrator, Pierluigi has been involved in both advertising and publishing, creating Communication Campaigns, Worldwide products Packaging and children’s books for major companies. 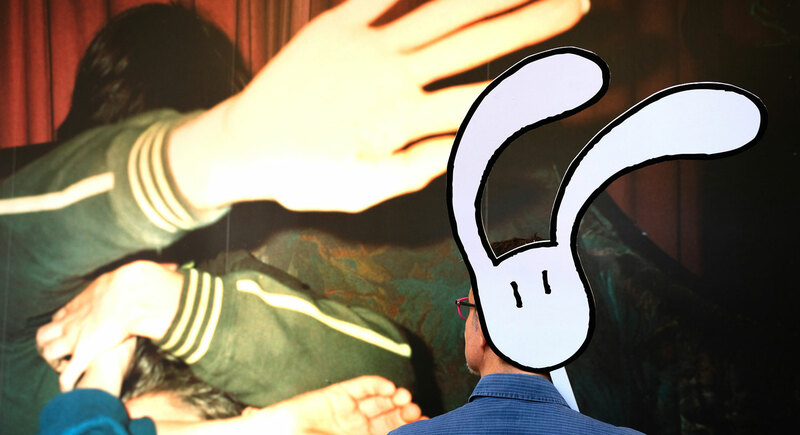 As an artist, he has been following the tracks of his Bix The Rabbit for almost 20 years and with him he has participated in collective exhibitions at several Italian galleries, has created editorial illustrations, discs, t-shirts, calendars, gadgets and everyday items. Pierluigi lives his life and spreads his creative activity between Italy and Indonesia. Fantasy, fun, simplicity, irony and even a bit of cynicism are the ingredients of his work, walking on the line that separates “high” art from “low” art as any pop icon, through works that can be in a gallery as well as on the city walls, on common objects, or inside children’s books as illustrations, just because this strange creature is flexible and can modify its tone of voice, style and style language according to needs and contexts. His works show how images can tell stories and open new perspectives on reality. Bix is an extraordinary character with 100 faces; wait, 101; hold on, 102; gosh, 317; 624, 792… Anyhow, there’s design, products, exhibitions and so on and on and on. Potentially Bix is ready to expand its reach, he can do more, he can give more. The operation has reached full artistic maturity and now we need critics to criticize, galleries to exhibit, magazines to show, instruments to expand, transmit, amplify. And, let’s face it, XXI century merchants in the temple are welcome. We have imagination ready to sell. Are you a blogger, journalist, media guru?